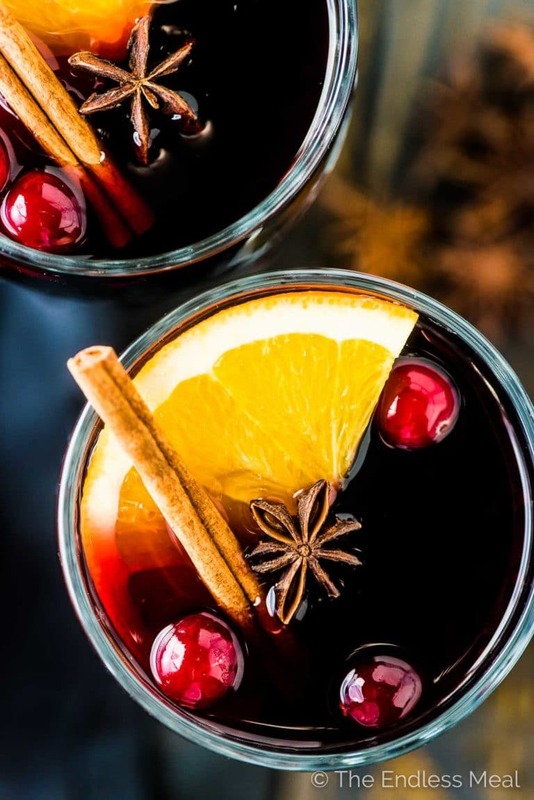 This delicious Brandy Mulled Wine Recipe is a must during the holidays. We've been making this recipe for years and it never disappoints. It's easy to make, perfectly spiced, and tastes like Christmas. Bonus: we make it with maple syrup for extra rich flavor and so that it's refined sugar-free. Let's cheers to the holidays! And there is literally nothing better to cheers Christmas with than traditional mulled wine. Or glögg, glüwein, vin brulé, grzane wino, varené wino, forralt bor, quentão or any of the other words for warm spiced wine. Whatever you call it, it's delicious. Nearly every year when we put up our tree, I invite all our friends and family over and put a big pot of mulled wine on the stove a half hour before I've said to arrive. When people show up, our place smells AMAZING. Mulled wine tastes and smells just like Christmas. It's the easiest winter drink to make. Put your inexpensive red wine, brandy, and spices into a pot. Then warm them up and drink. It's 100% foolproof. Even though I've measured the ingredients for you, when I make it for our tree trimming party, I simply eyeball the spices and it always turns out great. It'll warm you up and make you feel like you're sitting in front of a cozy fireplace. Your house will smell amazing when you make it. This is Christmas in a cup. This mulled wine recipe is one I've been making for years and this is the second time I'm sharing it with you. It's the 37th Throw Back Thursday post (love #tbt!) on the blog. The first time was back in 2011 and the original pictures are HILARIOUS. I've hidden them a few pictures down if you want to have a little laugh. 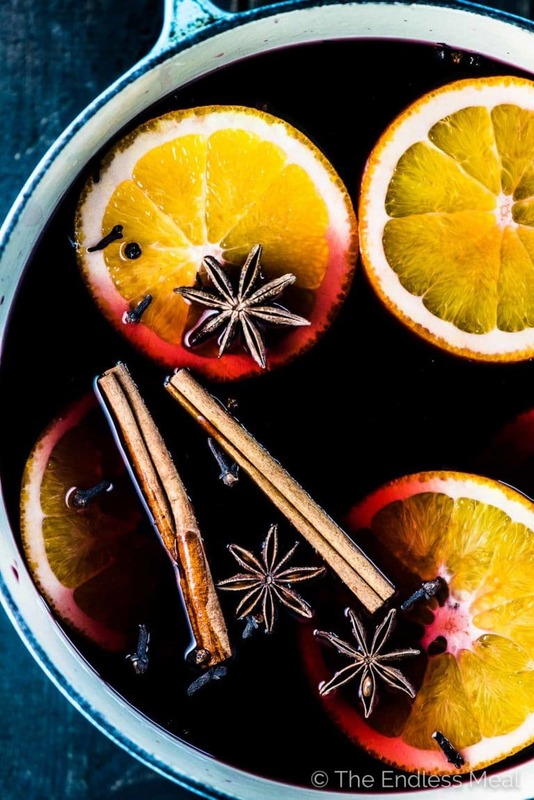 Lucky for us, this mulled wine recipe is SUPER EASY to make. If you can open a screw cap bottle of wine, you can make this. Pour the wine into a big pot. Now pour in some brandy and some apple juice. You've got this. Slice an orange and add that to the pot. See how easy this is? Now add a couple of spices. 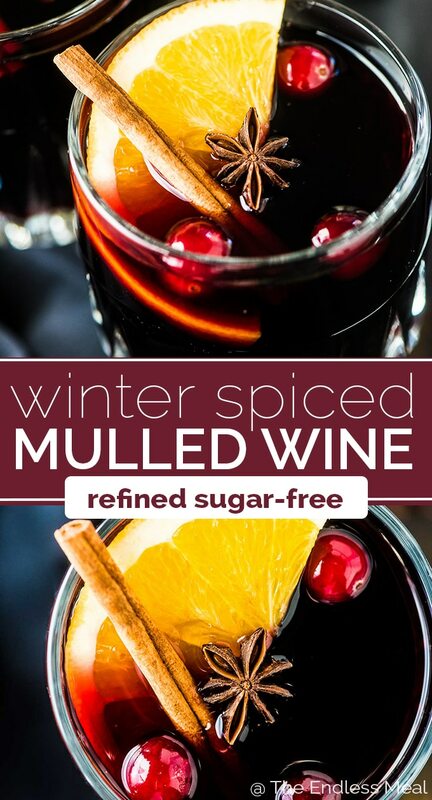 Isn't it awesome how easy it is to make mulled wine? When I pour the wine into mugs or thick walled wine glasses, I pour it through a small fine-mesh strainer. If you want to make your life even easier you can either strain the whole batch into a different pot or tie the spices in cheesecloth before you add them to the pot. 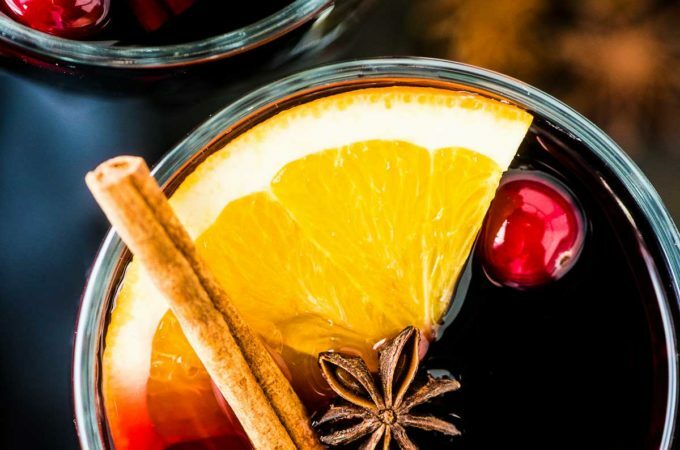 What are mulled wine spices? Mulling spices are always whole spices. If you use ground spices, you'll end up with a slightly gritty mulled wine. It's ok in a pinch if it's what you have on hand, but use whole spices if you can. 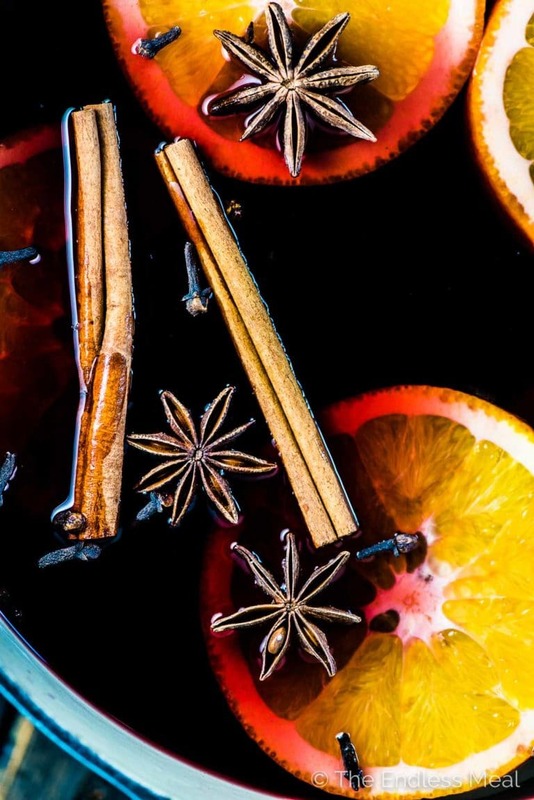 The mulled wine spices that I always reach for (and that are in this recipe) are cinnamon sticks, cloves, star anise, and peppercorns. 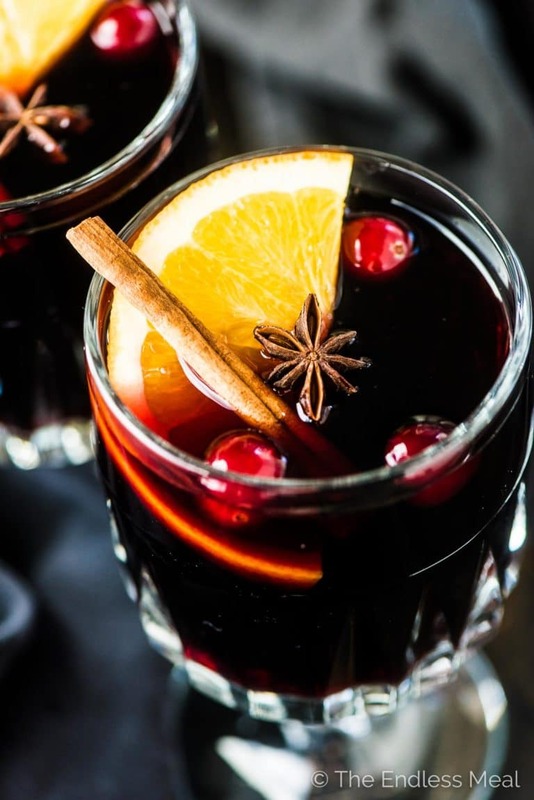 Mulled wine is a must during the holidays. We've been making this recipe for years and it never disappoints. It's easy to make, perfectly spiced, and tastes like Christmas. Bonus: we make it with maple syrup for extra rich flavor and so it's refined sugar-free. Add all the ingredients to a large pot over medium-high heat. As soon as you start to see steam rising from the pot, reduce the heat to medium. Keep the pot on the heat for 15 minutes for the spices to infuse the wine. Strain the mulled wine into mugs or thick walled wine glasses and top with any or all of the optional garnishes. Don't blow your budget on a good bottle of wine for this recipe. An inexpensive merlot or cabernet sauvignon is perfect. You can substitute coconut sugar or brown sugar for the maple syrup. Leftovers can be stored (with the spices strained) in your fridge for several days. You can drink it cold or gently reheat it. I made this recipe several times this winter and it’s easy and delicous. Thank you for the recipe! A slow cooker works really great for this. Set it on high for about 45 minutes, then to low. It stays warm and the flavours continue to mull. Gulp gulp gulp! This wine looks magical. oh! mulled wine IS Christmas to me! As soon as Christmas markets open in Europe, you can smell its rich spice in the streets. So it reminds me of all places I have spent Christmas time – of Prague, Amsterdam, Zurich, Lausanne, Cologne … It is a huge part of the season for sure. Makes Christmas shopping much more relaxing!